Following are a list of Belsebuub’s media appearances. Recordings of many of the interviews are on Belsebuub’s YouTube media channel and in the links below. Belsebuub has appeared on over 70 TV and radio shows, including 19 at the BBC, on Triple J radio in Australia, Rogers TV in Canada, and on Greek national television discussing the Gospel of Judas with leading academics. August 8 – Interview on ABC Australian national radio Triple J – The Graveyard Shift with Dave Callan discussing what karma is, how it works, and how it affects our everyday life – Karma – it is a reward or a punishment? March 29 – Interview on ABC Australian national radio Triple J – The Graveyard Shift with Dave Callan – What can we learn by having out-of-body experiences? January 25 – Interview on ABC Australian national radio Triple J – The Graveyard Shift with Dave Callan – Has humanity blown off course? 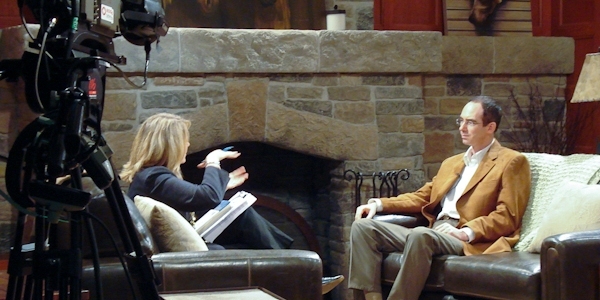 April 17 – Interview on Sigma TV – In the TV show ‘With Love’ a discussion on “The Gnostic Gospels and Christianity” with Belsebuub, a number of academics, and a leading Greek theologian and advisor to the Greek Orthodox Church. May 31 – 91.3 WLRN Tropical Currents, Miami, Florida (USA) – What is the nature of dreaming? 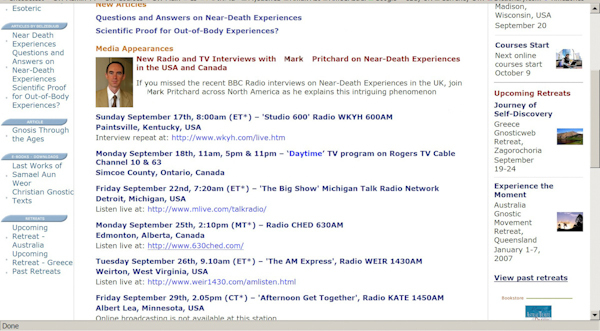 September 22 – ‘The Big Show Michigan’ Talk Radio Network, Michigan – Are near-death experiences real or are they created by the brain? September 25 – ‘Two Johns No Waiting’ Radio KMOX 1120AM , St. Louis, Missouri – Do dreams have meaning? September 27 – ‘Rover’s Morning Glory’ CBS Radio WXRK 92.3FM, Cleveland, Ohio – Near-death experiences – are they real? September 18 – ‘Daytime’ on Rogers Television Cable Channel 10 & 63, Toronto – What is the astral plane? October 6 – ‘Feedback’ CKLQ Radio, 880AM, Manitoba – Why do we have good and bad dreams? July 12 – BBC Radio Cleveland – Why have an out-of-body experience? August 8 – BBC Radio Swindon/Wiltshire – Have you ever had a near-death experience? August 25 – BBC Radio Cleveland – Why do we get nasty dreams? August 29 – BBC Radio Northampton – Are dreams just random, or do they mean something? August 29 – BBC Hereford and Worcester – Why do we have bad dreams and nightmares? September 3 – BBC Radio Manchester – How important are dreams? A radio show in the Bay area California discussing astral projection. A curated selection of these media interviews is also available as a podcast on iTunes, Player.fm, and Stitcher, and as streaming media on Soundcloud and on Vimeo.